The work of this Centre is at the forefront of addressing theoretical and observational issues in solar and solar system physics that include solar magneto-seismology, dynamics of the solar atmosphere, solar wind, magnetosphere and Space Weather. This Centre is one of the largest and most dynamic solar and solar system physics research groups in the country and is well renowned internationally. The Solar Physics and Space Plasma Research Centre (SP²RC) at the University of Sheffield seeks to understand the nature of key plasma processes occurring in the solar interior and the atmosphere of the Sun, from photosphere to corona, with particular attention devoted to the various coupling mechanisms of these apparently distinct regions. A large part of the energy flux released in the solar atmosphere travels into interplanetary space and impacts on the Earth's bow shock, energising the magnetosphere and influencing the composition, energy balance and dynamics of the ionosphere, plamasphere and plasmapause. The generation of energetic events in the convection zone and their propagation through the solar-terrestrial system is investigated by members of SP²RC by using mathematical modelling. Our mathematical approach involves rigorous analytical work and the implementation of parallel computing (GRID technology) where results are continuously tested by making and using ground-base(e.g. SST, DSO) and high-resolution satellite observations (e.g. SOHO, TRACE, Hinode, SDO and IRIS). SP²RC's research programme involves projects on Helioseismology, Convection Zone & Tachocline, Oscillations & Dynamics in the Solar Atmosphere, Global Coronal Seismology, Magnetic Reconnection, and Absolute & Convective Instabilties. We have also started a new research direction in Space Weather. 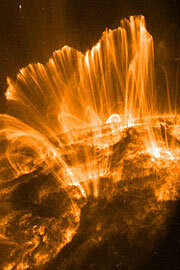 Here, the aim is to improve our capability of forecasting solar eruptive events (flares and CMEs). Mathematical modelling of PV systems is another new area of SP2RC. We have led development of a new modelling tool to optimise even more efficiently PV systems by taking into account the geographic position of the facility itself. Another new aspect is the implementation of state-of-the-art climate modelling (together with the Department of Geography and the UK Met Office) and estimating the predicted savings. Continuing work is aimed at (i) improving the efficiency of individual cells by applying non-homogeneous and structured optical waveguides; (ii) fine-tuning the climate model's capabilities applicable to as wide as cites worldwide. This project is in collaboration with the University of Warwick and Shandong University (China). to understand the key important physical processes governing the energy flow from the convective zone to the solar atmosphere and down to the Earth's upper atmosphere using analysis of observational data, and through mathematical and computational modelling. to model the coupling of the various traditionally considered `distinct' regions of the Sun-Earth system (e.g. momentum transport through tachocline; coupling of global solar oscillations to the solar atmosphere; magnetic coupling from photosphere to corona and CMEs; etc.). to develop and update our mathematical and computational models, and our data analysis techniques to achieve the above objectives. to verify observationally our mathematical and numerical modelling. to absorb advances made elsewhere and disseminate our results/knowledge base in order to keep the Group's activities at the forefront of world-wide research. to offer PhD and postdoctoral training of the highest possible quality. to contribute UK's leadership of the high-profile international solar research. 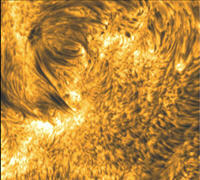 Discovery of Alfvén waves in the lower solar atmosphere.